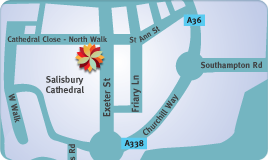 Susan Phillips and her team would like to welcome you to The Cathedral Close Dental Practice in Salisbury. We are a private dental practice and our aim is to provide a comprehensive range of high quality dental prevention and treatment in relaxed and friendly surroundings. After your visit we will take time to explain all your treatment options and a written estimate of costs will be provided. We don’t just want to provide high quality treatment - we also want to provide the best value for money as well. At The Cathedral Close Dental Practice, we want you to feel relaxed and at ease whilst you receive our personalised, high quality dental care. We understand that you may feel anxious about your first visit and want you to be reassured that our caring, highly trained team will do all they can to put you at ease. From the moment you make contact with us, right through your dental appointments and after care, we will listen to and take the very best care of you. Susan Phillips and Gillian Siggers are the two general dental practitionersat our practice. They provide check-ups and all routine dental care. This would include fillings, crowns, bridges, dentures, cosmetic dentistry and straight forward extractions and root canal treatments. They both have a strong interest in helping you achieve and maintain healthy and beautiful smiles. We have a range of specialists at our practice, who provide specialist treatments such as complex root canal treatment, oral surgery and complex extractions,the replacement of missing teeth with implants and periodontics.More information is available on these services – please ask at reception. We have two very caring and gentle hygienists working at our practice. Sally Granger has been with us since 2011 and Debs Allan joined our team in 2015. Sally and Debs will help you keep your mouth and especially your gums healthy. Sarah Fanner has been at the practice since the beginning and will welcome you when you arrive. Sarah works on the front desk and besides running the practice will also be your first port of call. Sarah worked for many years as a dental nurse so will be able to answer all your questions. ‘Dr Phillips is so gentle and lovely to me and the staff are so welcoming and friendly’.